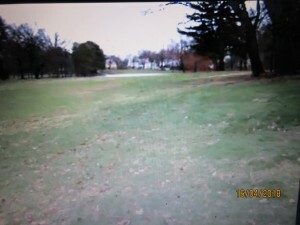 Home→2-3/4 inches of rain in 5 hours Brings Back the “Phantom Duck Pond” on Ridgeway fairway. ← Stormy Weather: Gusty Winds drive rains and make Westchester Nervous. 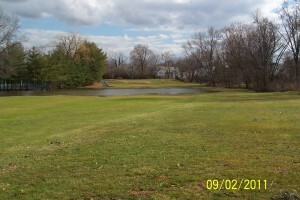 2-3/4 inches of rain in 5 hours Brings Back the “Phantom Duck Pond” on Ridgeway fairway. RIDGEWAY FAIRWAY TODAY. 1:30 P.M. The strip of white below the abandoned country club buildings is standing water (“The Phantom Pond” that accumulated today (Wednesday) and flowed over to the tennis courts. A recurring condition as can be seen from the 2011 photo below. RIDGEWAY FAIRWAY 7 YEARS AGO. Rain made lawns and basements quite wet today, pounding on the windows dancing on concrete and making trees sway in relentless howling wind. White Plains Westchester Airport reported 2 and 3/4 inches fell by 3:30 P.M. today. The former Ridgeway former country club property showed that it floods again today in any saturating rain. If it the FASNY-Gedney Association matter ever gets out of court, and gets built, the matter of flooding effects could be considerably more devastating. Today showed that when you get a heavy rain, it creates flooding despite six years of contention by it owners (the French American School of New York) that flooding is not a condition that should prevent adding to impervious surfaces with a 5 building campus and impervious concrete parking lots. As of 1:30 P.M., A video shot today shows what a lingering soaking rain can do to this controversial property. The photo at the top of this article is a video capture from that video showing the flooding matches that of a previous storm 7 years ago in the same location as today. Mr. Seidel forwarded this picture from a previous time when the “duck pond” formed. It is a phantom pond that forms whenever a 2 inch rain falls and the club grounds saturates.